Alexandria, VA— Just minutes from Washington, DC, visitors can feel transported by an old fashioned sense of holiday wonder on Old Town Alexandria, Virginia’s brick-lined streets and historic waterfront, with festive events, twinkle-lit trees and shopping at local boutiques. Alexandria is famous for its holiday traditions and events, including the Campagna Center’s 45th Annual Scottish Christmas Walk Weekend, featuring a parade with dozens of Scottish clans in tartan, the 16th Annual Holiday Boat Parade of Lights on the Potomac River, and the 21st annual First Night Alexandria, a spectacular New Year’s celebration with over 100 performances and a fireworks finale. Independent boutiques kick off the shopping season with one-of-a-kind Black Friday and Small Business Saturday events, where windows lit with holiday decorations sparkle with special gifts for loved ones. For parades, candlelight tours, festive performances and more, check out the listings below. Named a Top 10 Christmas Town by HGTV, Alexandria offers an authentic holiday experience – the way it was meant to be. Don’t miss Old Town Alexandria’s most spectacular holiday weekend. In 1749, the City of Alexandria was officially established by three Scottish merchants and named after its original founder, John Alexander, also of Scottish descent. Today, the city continues celebrating its heritage with a weekend of festivities. The iconic Scottish Christmas Walk Parade takes place on Saturday, December 5, at 11 a.m., when dozens of Scottish clans dressed in colorful tartans will parade through the streets of Old Town, joined by pipe and drum bands from around the region, as well as terriers and hounds. More weekend events include a Taste of Scotland (12/4), Heather and Greens sale (12/4 and 12/5), Holiday Marketplace (12/5), the Campagna Center’s Holiday Designer Tour of Homes (12/5), and Deck the Halls with Santa (12/6). At sundown on the day of the Scottish Christmas Walk parade, Alexandria&apos;s harbor lights up as dozens of illuminated boats cruise the Potomac River at the historic waterfront, led by Alexandria&apos;s fireboat The Vigilant and Washington, DC&apos;s fireboat John Glenn. DC media personality Tommy McFly of 94.7 Fresh FM will be the parade announcer. At the marina before and after the parade, stop in to the “Holiday Festival: Take a Walk in the Woods” at the Torpedo Factory Art Center between 4 and 9 p.m. to enjoy musical performances plus gift shopping in open artist studios. Santa will visit the Torpedo Factory until 7 p.m.
$20/before December 14, $30/after, children 12 and under, active military and volunteers are free! This annual New Year&apos;s Eve bash takes over Old Town Alexandria with more than 175 performances at 29 indoor venues, with live music, dancing, children&apos;s face painting and games. The afternoon’s Seventh Annual Fun Hunt is accompanied by all-new activities for families and pets. There’s an old fashioned carnival at the Mount Vernon Recreation Center in Del Ray. First Night’s fireworks finale returns with a spectacular display over the Potomac River at midnight. Wednesday-Thursday, 8 p.m.; Friday, 8 p.m.; Saturday, 3 & 8 p.m.; Sunday, 3 & 7 p.m. Created by Kathy Feininger and directed by Michael Sharp, this MetroStage holiday tradition is a delicious cross between the classic Dickens’ tale and uproarious song parodies of 33 Broadway show tune favorites by Rodgers and Hammerstein, Andrew Lloyd Webber, Stephen Sondheim and many more. At this official kickoff to the holiday season, the mayor and Santa Claus will light the city tree in Market Square, accompanied by live entertainment, a visit with Mr. and Mrs. Claus, and more. “Shop Small” on Black Friday in the region’s biggest destination for independent boutiques - Alexandria, Virginia. More than 50 local boutiques will open early, offering once-a-year deals. The city is offering free parking at parking meters and the Free King Street Trolley will begin operating at 6 a.m. Participating stores will open at 6 a.m., offering initial discounts of up to 30% off. At 8 a.m., the discounts drop to 20% off and 10% off starting at 10 a.m. Stay for the annual City of Alexandria Tree Lighting Ceremony at 6 p.m. on Market Square. Head to the DC region’s “Shop Small” headquarters for Small Business Saturday. 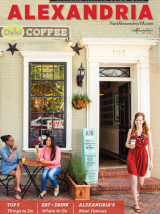 More than 30 independent Alexandria boutiques will offer special promotions, such as merchandise discounts, gifts with purchase, complimentary services, treats, and/or festive activities. Saturdays and Sundays, Nov. 27-28, Dec. 4-5, 5-8 p.m.; Sunday, Dec. 20, 5-8 p.m.
Join “Mrs. Washington” as she hosts an enchanting evening of candlelight tours, fireside caroling and festive treats. Timed tickets are $22 for adults and $15 for children 11 and under. Tickets available October 27th at 10 a.m. at the Ford Orientation Center or at MountVernon.org. Holiday visitors will enjoy themed decorations, chocolate‐making demonstrations and 18th‐century dancing, plus a rare opportunity to tour the third floor of the Mansion. In 1787, George Washington paid 18 shillings to bring a camel to Mount Vernon for the enjoyment of his guests. Today, visitors can meet Aladdin the camel on the grounds. Thursday-Friday, 8 p.m.; Saturday-Sunday 3 & 6 p.m. The family-favorite classic by Charles Dickens, equipped with special effects, Victorian carols and Tiny Tim returns to the Little Theatre of Alexandria. The story follows Ebenezer Scrooge, a miserly Victorian humbug, who travels with ghostly guides through Christmas past, present and future to find the true meaning of the holidays. Del Ray’s annual Holiday Market offers unique handmade fine arts and crafts from local artists (including pottery/ceramics, photography, jewelry, fiber, paper crafts and glass). All artists donate a percentage of their sales back to Del Ray Artisans to help support future programs. Different artists each weekend! Open House and Holiday Party: Friday, 6-9 p.m.
Holiday Ceramics Sale: Friday, noon-9 p.m., Saturday, 10 a.m.-6 p.m., Sunday, noon-5 p.m.
Holiday Jewelry Sale: Friday, noon-9 p.m., Saturday, 10 a.m.-5 p.m. The Art League helps kick off the holiday season with an annual art celebration and open house featuring exhibits, live music, artist demonstrations, and refreshments, as well as a weekend-long ceramics and jewelry sale of handmade wares by Art League students and associates. Friday-Sunday, December 4-6, 11-13, 11 a.m.-7 p.m.; Friday-Wednesday, December 18-23, 11 a.m.-7 p.m.
Wednesday, December 24, 11 a.m.-2 p.m. While shopping for unique art and craft items for loved ones, at this unique holiday market, visitors can enjoy live entertainment, traditional European food and sweets, wine and beer. Also present will be a children’s corner featuring kids’ activities that help little ones learn more about European traditions and culture. The “Soldiers’ Christmas” event will feature re-enactors from the First Virginia Regiment, who will highlight colonial life in Alexandria during the holidays at the time of the American Revolution. Some of the activities visitors will see include demonstrations of military drill, fife and drum music, gaming, cooking, and more. The Regimental surgeon will be discussing Continental Army medicine and demonstrating 18th-century surgical instruments in the museum. There will be activities and colonial games for children. The program takes place immediately following the annual Scottish Walk parade in Old Town Alexandria. Give the gift of art this year. The Torpedo Factory Art Center will transform into an enchanted winter forest this December. During the Holiday Festival, more than 140 artists will keep their studios open late for patrons to find special handmade gifts. Adding to the festive atmosphere, the Alexandria Choral Society and the Braddock Brass Quintet will perform seasonal favorites throughout the evening. Santa will visit and hold court on the 3rd floor until 7 pm. Stop in before and after the Holiday Boat Parade of Lights on the waterfront to buy one-of-a-kind presents for one-of-a-kind loved ones. Discover your holiday spirit with a visit to Del Ray for the annual holiday tree lighting and a special appearance by Santa Claus, who will lead carols and sit for photos with children. The celebration continues with an evening stroll down Mount Vernon Avenue, which will be illuminated by thousands of candles called “luminarias.” In the true spirit of the holidays, the community will be collecting items such as canned goods, diapers and towels for the Carpenter’s Homeless Shelter. We also have 12 Christmas Trees along Mt. Vernon Avenue—each one decorated by a local non-profit or business. The public can vote on their favorite one between Dec. 5 and Christmas day. Winner receives $500! Visitors meet a Civil War-era Santa at this family-fun holiday event exploring how Christmas was observed during the Civil War. The program features living-history interpreters, a Victorian Christmas tree, refreshments, readings of The Night Before Christmas and a patriotic Santa Claus inspired by a Thomas Nast illustration for Harper’s Weekly newspaper. Guided tours of the fort, weather permitting. Saturday, 6-9 p.m., Sunday, 3-6 p.m. Please allow 1.5 - 2 hours to tour all four sites. $25 for adults, $20 for active military and seniors (65 and older), and $5 for children (ages 6-17). Bring three centuries of Holiday Cheer to your celebrations this year! Historic Alexandria Candlelight Tours, the city’s premier historic holiday event, blends history, food, and drink through special tastings, seasonal decorations, period music and tours highlighting festive traditions. Tour Gadsby’s Tavern Museum, Carlyle House, The Lloyd House and Lee-Fendall House. Special seasonal libations may be purchased along the tour! Free shuttle service between sites is available. The Colonial English Handbell Ringers return with their annual concert at The Lyceum, featuring performers from across the Maryland/D.C./Virginia area clad in colonial attire, bringing a 5-octave set of nearly 80 handbells from the world-famous Whitechapel foundry in London. Be our guest at their upcoming "Silver Bells" 25th Anniversary Celebration. Our concert this year features several new exciting holiday pieces, music from around the world, a sing-a-long, classics and showstoppers you are sure to love! We thank you for our 25 years of patronage and support. Identical FREE performances at 2 PM and 4 PM, and seating capacity is limited, so reservations are required. Donations gratefully accepted. Mount Vernon will open its doors for an evening of holiday-themed fireworks and special programs. Before the fireworks show begins at 8:45 p.m., watch colonial artisans make chocolate, meet re-enactors from the First Virginia Regiment, enjoy cider by a bonfire, and learn 18th century dance moves from costumed guides. “General and Lady Washington” will be on hand to greet Mount Vernon’s holiday guests, who can learn more about the Washingtons’ Christmas traditions in a tour of the first and second floors of the mansion. Visitors can also look forward to performances by local choirs and musicians playing 18th century tunes, with the evening culminating in a sparkling fireworks display set to holiday music and overlooking the Potomac River. Go to www.VisitAlexandriaVA.com/holidays for events and more.